Adventures in Kindergarten: Teacher Week: Who am I? Nope, it's not an existential question. 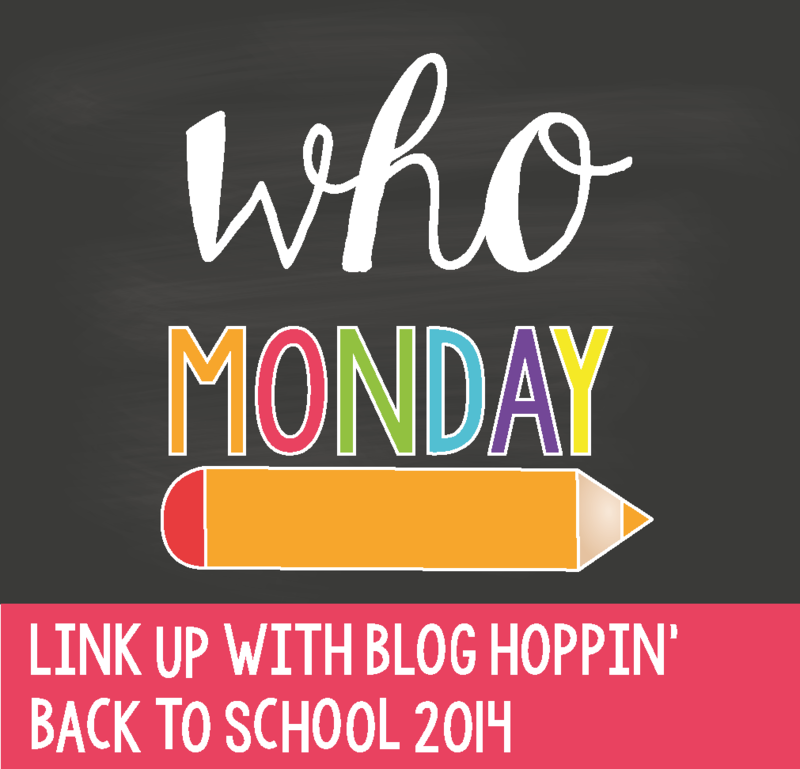 I am linking up with the ladies of Blog Hoppin' for Back to School Week. I will be playing along every day this week. 1. I just got married! After more than six years of dating, my best friend and I tied the knot a month ago. I am beyond blessed to have found a man who is proud of who I am yet pushes me to strive to be a better person, wife and teacher. He is also a giant mush ball like myself, and may or may not have shed a tear when he saw me walking down the aisle. Love.this.man! 2. 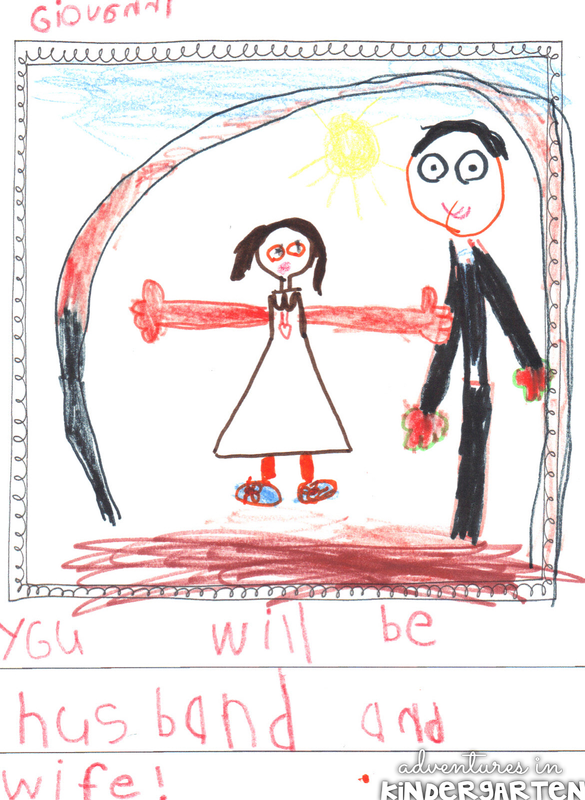 My students were at my wedding... sort of. 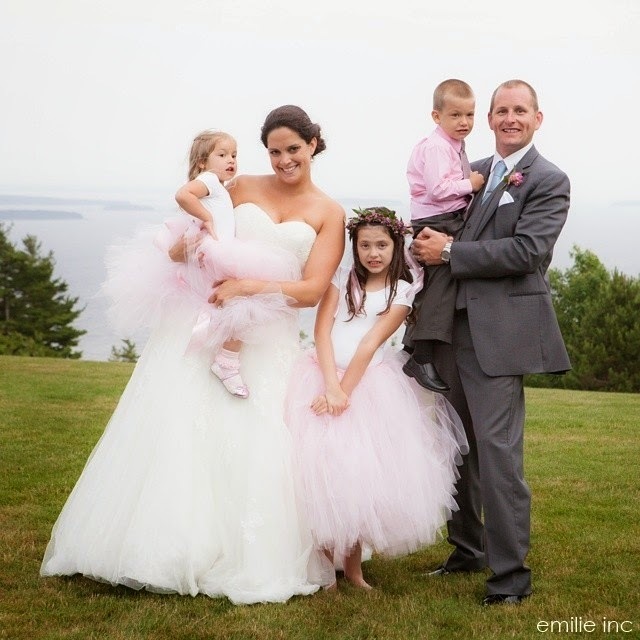 Of course, being a teaching fanatic, I had to incorporate some teacher details into my big day. This was our fan program. I LOVED how they came out but they were such.a.pain to make! 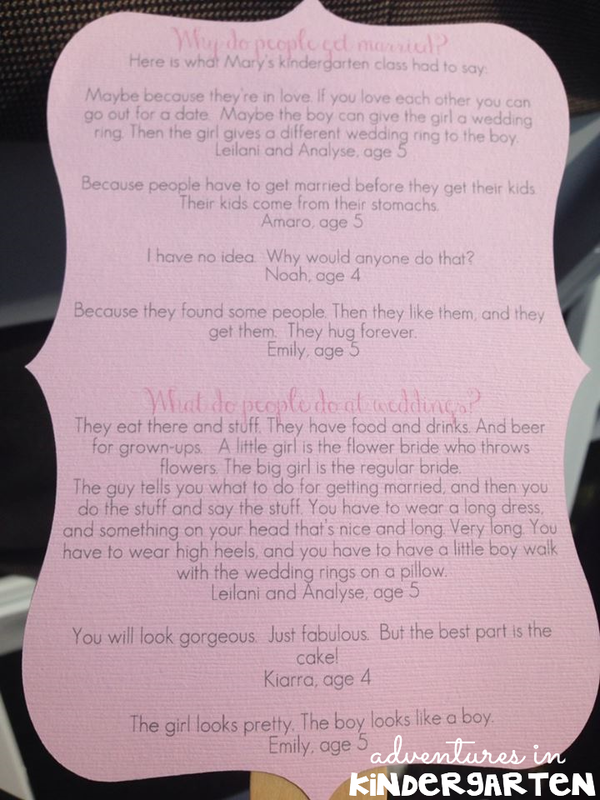 On the front is your standard wedding information, but on the back are some awesome kid quotes from last year's little ones. I was cracking up the whole time I was taking down their quotes. In my mind there is nothing funnier than a brutally honest five year old. Our guests love them too... we got tons of compliments on the programs. I also had the kids whip up a book for us to display at our reception. 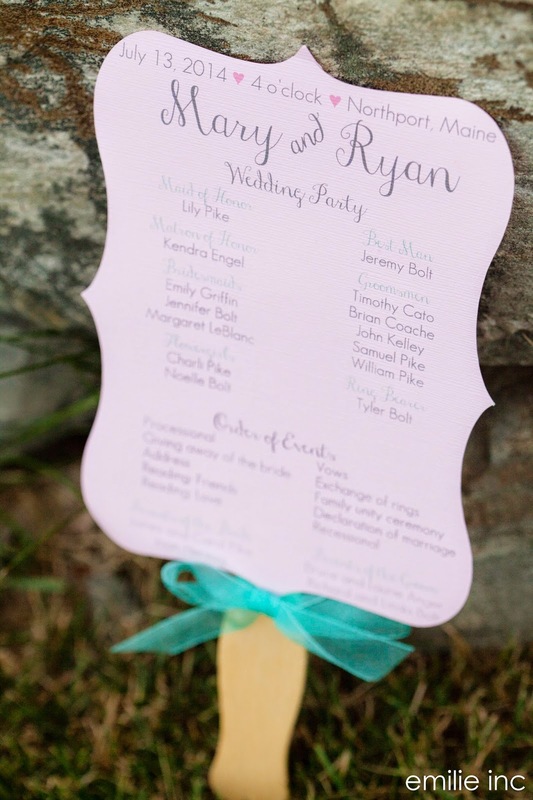 The title is "Ms. Pike and Mr. Ryan's Wedding." They put so much hard word and love into the drawings... I was so touched by it! 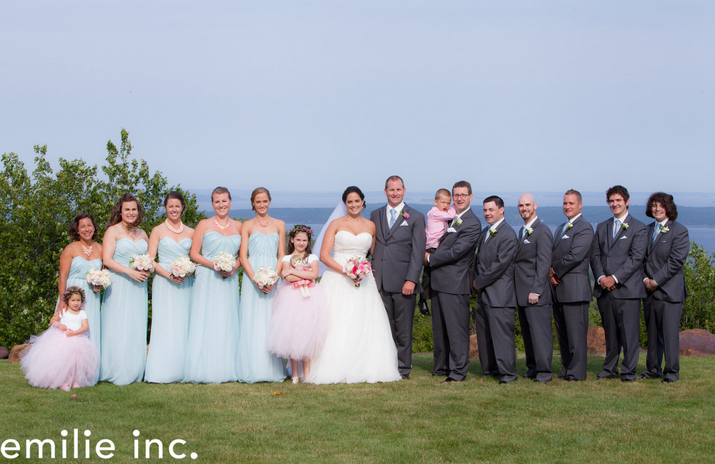 In case you are a wedding fanatic like I am, you can check out more pictures and details about our big day here or here. 3. I am ADDICTED to yoga. I have dabbled in yoga, taking a few classes a year since I was 16. In March, my gym installed a yoga studio and ran a promotion with free classes for a month. I got positively hooked! 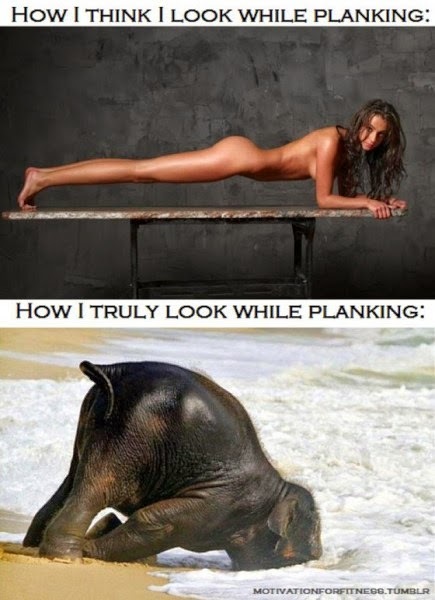 My new favorite weekend morning routine is lifting for 30 minutes and cardio for 30 minutes followed by a yoga class. If you had told me a year ago that I would actually ENJOY going to the gym I would have thought you were crazy! I think that yoga might have been the only thing keeping me sane during insane wedding prep and the end of school year madness. 4. I am also addicted to Instagram! I post something almost every day, and have a compulsive need to read every.single.post in my feed. If I don't check it for a few days, I have to scroll all the way down to make sure I have looked at every photo... cray cray, I know. 5. 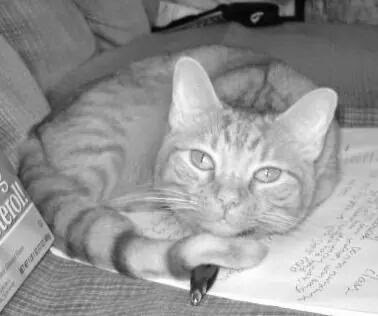 I am a mom... to an adorable orange tabby cat named O'Brien. He is a small little kitty (only seven pounds, fully grown) with a humongous personality. He gets into absolutely everything and keeps us laughing every single day. I love kids (duh!) but am totes not ready to be a real mom yet, but I am perfectly happy to have food babies every so often. 6. Little known fact: when I am alone in my car I do a pretty spectacular Beyoncé impersonation. I have been to three of her concerts in the last year and a half or so. 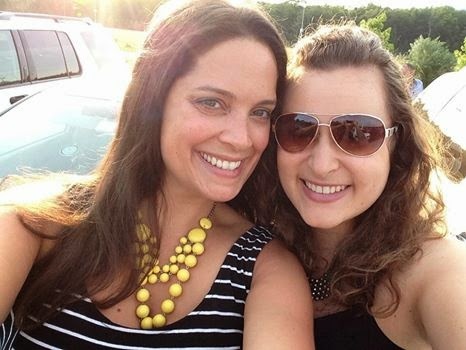 My BFF (a fourth grade teacher) is obsessed too... she and I went to Bey and Jay Z's On The Run show as an end of the school year treat to ourselves. 7. I have epic dance moves. By epic, I definitely don't mean that I am a good dancer. I mean that I LOVE to dance and my loved ones LOVE to make fun of my awesome moves. Even my five year old nephew makes fun of me! He does my signature hip shaking move and says "Look, I'm doing the Auntie Mary dance!" 8. I taught myself how to cook. When I was in college, I lived in a cooperative house with 23 other ladies. We all took turns cooking for the whole house three times a semester. When I started living there during my sophomore year, I was absolutely horrified at the thought of cooking for 24. My grandmother coached me through a few recipes over the phone, and my love of cooking took off from there. I knew it paid off when my husband mentioned my lasagna on bended knee during his proposal! 9. 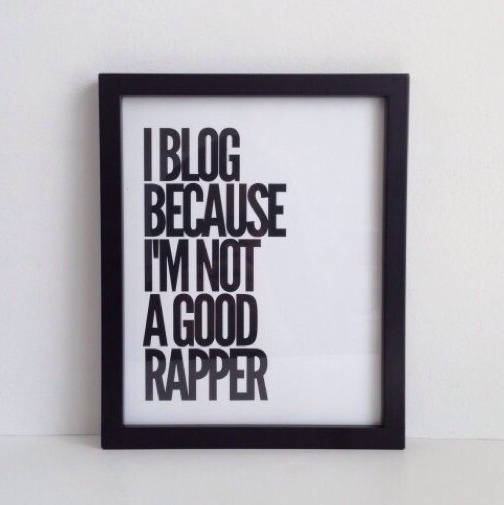 I blog because I'm not a good rapper. True story! I know every word to Shoop and most of TLC's repertoire, and love to sing/rap those jams but I would never ever dare to do it in public. 10. I can tell you the gender of a lobster in 1.4 seconds. I will just flip that sucker right over and tell you if it is a he or a she. Cool party trick, huh? I guess that growing up in Maine has it's perks. I cracked up at the lobster comment - that is definitely a fun party trick! Also love the kid comments and drawings - I save those all the time to look back on! 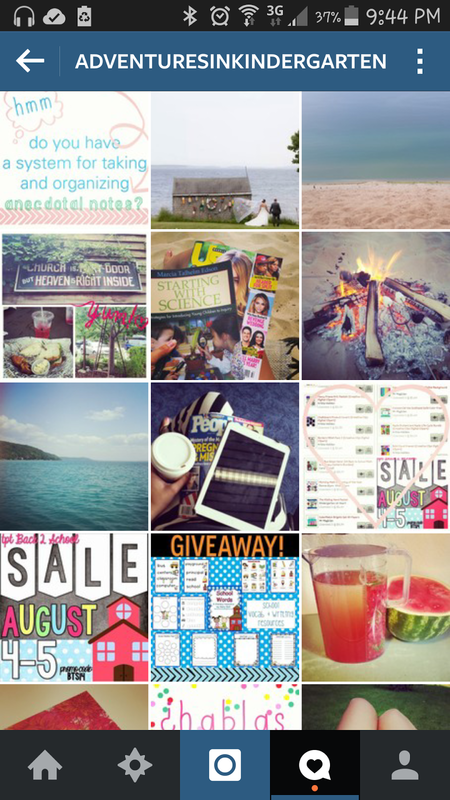 I think I need to learn from you about Instagram....That is next on my list of social network learning! 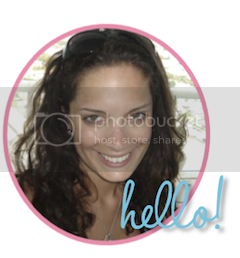 Nice to meet you on the blog hop! Alex - you will love Instagram. I totally recommend it! Thanks for stopping by my blog I am so glad you found it.